While Apple's most recent innovations have come from portables like the iPad Air and iPhone 5s, a document uncovered on Thursday reveals a feature-laden keyboard with multi-function "keystacks" that integrate miniature displays, touch sensors and haptic feedback mechanisms. Showing the company is still making advances in more traditional tech, an Apple patent filing for "Multi-functional keyboard assemblies" describes a keyboard consisting of an array of so-called "keystacks," or individual keys layered with electronics, sensors and switches. 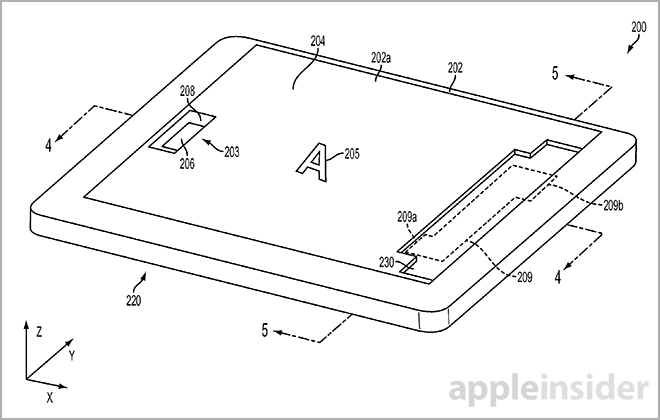 Published by the U.S. Patent and Trademark Office, Apple's application takes cues from third-party accessories like Art. Lebedev Studio's Optimus Maximus keyboard, which sported clear keycaps overlaid atop small configurable OLED displays. 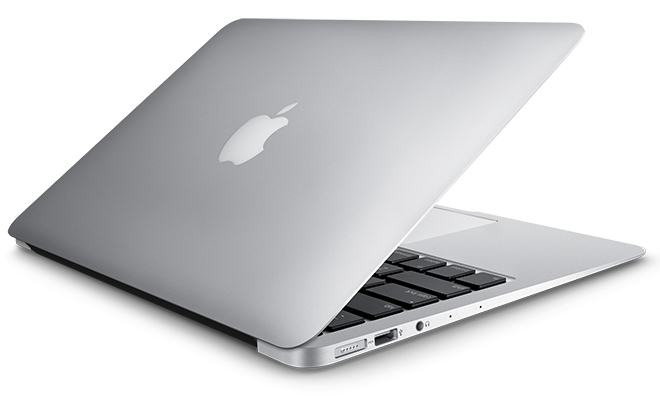 While both standalone and integrated laptop keyboards are covered in the patent language, it should be noted that the first illustration shows a current-generation MacBook Air. The Maximus, and successor models like the Optimus Popularis that feature keys with built-in displays, are highly functional tools as each key can be mapped to output specific letters, icons or pictures with corresponding customizable commands. Being small-batch products, the Optimus line never really caught on due to prohibitively high price tags and sub-par performance. Apple's invention builds on this display-within-key concept by adding multiple layers to the keystack. While the Optimus is limited to input via a physical switch and output through an OLED, Apple's invention allows for multiple modes of input and output. For example, the multi-functional keystack can be configured to accept user input through a switch-type button, while a capacitive surface component can provide a second independent input through multitouch gestures. Going further, Apple notes the system gives users visual feedback through a backlit display integrated into each key. Based on OLED, LCD or other screen technology, the display sits above or below touch circuitry and is viewed through a transparent portion of the key. In some embodiments, the keycaps are made of glass or a similarly rigid —yet durable —material that is stronger and thinner than traditional plastic parts. Diving into the workings of Apple's patent, the invention states each key has its own circuitry that is operably connected to one or more system processors. The basic keystack incorporates a support structure (scissor or butterfly switch), flex circuit, light guide and display. More advanced forms add in capacitive sensing and haptic feedback mechanisms. Acting as a regular keyboard, the invention allows users to reproduce glyphs, characters or symbols onscreen as they are seen displayed on each key. With dedicated circuitry in communication with a computer's processor, however, the keyboard is able to output visual and tactile information corresponding to a user's input. The keyboard accepts normal dome switch presses, pressure-sensitive input and capacitive touch-based gestures. Using the latter embodiment, Apple's keyboard is able to replace a traditional mouse or multitouch trackpad. In one example, the document describes a user flipping through the pages of an e-book in iBooks by swiping across certain keys or key combinations. Both scissor (left) and dome type switches are supported in Apple's invention. Finally, switches located at the base of each keystack are, in some forms of the invention, able to respond to user input through haptic feedback like vibrations, clicks and increased resistance in relation to a button press. The rest of the application covers details regarding keystack implementation in standalone and integrated keyboards. Variations on display techniques are also discussed and include less dynamic forms of visual feedback relating to multi-colored light sources and optical filters. Apple's multi-functional keyboard assemblies patent application claims benefit of a provisional application first filed for in 2012 and credits Craig C. Leong, James J. Niu, John M. Brock, Keith J. Hendren, Thomas W. Wilson, Jr., Bartley K. Andre, Mikael Silvanto and Dinesh C. Mathew as its inventors.